In the Cosmopolitan series, design and functionality are balanced. The style is perfect for the modern bathroom, in which geometric shapes and clean lines play a key role. And where the bathroom has become more than that old-fashioned functional space, it nowadays also offers space for relaxation. 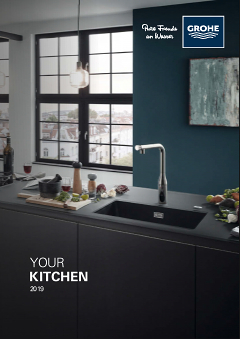 In the Cosmopolitan series you can find several taps and showers for kitchen and bathroom, but just as many accessories to implement your style to the very last detail. Like this soap dispenser in durable GROHE SuperSteel with brushed stainless steel look.